Is any this true? Who knows. Probably not. Or it’s at least heavily embellished, but intriguing stuff either way. If Brett Brown hasn’t lost the locker room, the Sixers can probably use Sheridan’s report as a rallying point, and teams will look for any extra edge they can find this time of year. 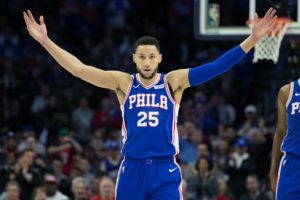 So, are the Sixers headed for chaos, ignited by a pivotal Game 3 loss, or are they about to take control of this series? The Pennsylvania Gaming Control Board held their monthly meeting today and among the topics discussed were the launch of online casino games in PA. This shines a spotlight on the launch of PA online sports betting. As expected and was previously communicated by Executive Director Kevin O’Toole, online casino games will launch in PA on July 15, 2019. O’Toole told the board that his office had exacted regulation requirements for establishing a commencement date for iGaming in PA. They recommended 90 days and a coordinated go live date of July 15 for 10 certificate holders and three licensed operators. This, however, does not include sports betting, which could actually be coming sooner. Dustin Gouker of Play PA reports that sports betting could launch well before this date. This matches with what Parx Chief Marketing Officer Marc Oppenheimer told Pennlive last month– that they would be ready with their sportsbook as early as April. Sources had previously told us Pennsylvania may hold several apps back to have a shotgun start as a coordinated launch date, similar to what the state will do with online casinos. Further, several operators have indicated to us that they are in the late-stages of launch preparation plans, including getting apps ready for testing and ensuring promotional partners are properly licensed with the PA Gaming Control Board. We’ve put together a complete guide to PA sports betting, but among the apps you should expect to see at or near launch are: SugarHouse Sportsbook, FanDuel Sportsbook, Parx Sportsbook, and Rivers Casino Sportsbook. Branding may be an issue. In PA, outside brands (like FanDuel) need to partner with licensed casinos in the state. In the case of FanDuel, the now-leader in New Jersey, it has a partnership with Valley Forge Casino and Resort. Apps will be branded with the operator’s name. This all means that PA and NJ sports betting apps will literally be different “apps.” There’s certain to be some confusion here. We’ll keep you updated on everything as this is now my life’s mission to be your sage on all things legal betting in PA.
There’s been some really strange odds action on the Sixers-Nets series. Let’s talk about what it does and doesn’t mean. The Sixers opened at -2500 at DraftKings Sportsbook. Right now, they can be had for a relatively cheap -501 at PointsBet. What gives? On the surface, that moves seems concerning, as a move in this direction feeds into the pause local fans have regarding the cohesiveness of the unit, Brett Brown’s coaching ability, and of course Joel Embiid, who as of Friday is uncertain to play in Game 1. UPDATE: Sixers Game 1 line has now moved down to as low as -5.5 on news that Joel Embiid is doubtful. In an interview with The Wizard over at PointsBet earlier on Friday, the Montauk-loving market maker for one of NJ’s newest sportsbooks says there is indeed quite a bit of concern over Embiid… and this was before the Sixers fanned those flames at practice on Friday. Game 1 was even briefly off the board at PointsBet… before the Sixers mentioned Embiid might be out. DraftKings has been much more bullish on the Sixers, currently listing them at -835 to win the series. FanDuel has them at -650. It’s worth considering that NJ sportsbooks take huge action on Philly teams, so DraftKings specifically maybe be keeping the odds longer (for the Nets) to balance out what will likely be heavy Sixers action. They also tell us they’re operating as if Embiid is playing until they hear for sure otherwise. FanDuel Sportsbook is running the most aggressive Masters offer we’ve seen for New Jersey sportsbooks this year– 100 to 1 odds on any golfer to win The Masters. The promotion was originally scheduled to end at the start of the tournament – which makes some level of sense – but today FanDuel announced that they will extend it through end of day Friday, April 12 at 11:59 p.m.
Register with FanDuel Sportsbook using this link and enter promo code CBB. Select any golfer to win The Masters. If your golfer wins the tournament, you will receive a site credit equal to the difference between the payout received based on your Starting Price Odds and +10,000 on the first Five Dollars ($5) of your bet. For example, if you were to select Rory McIlroy at +800, the remaining +9,200 would be paid out within 72 hours. Your winnings will come with a “play-through” requirement, meaning you’ll have to wager them within 7 days on something with longer than -200 odds (basically, you can’t take extreme favorites), before they can be withdrawn. These 100-1 odds boosts are among the most popular promos we’ve seen in New Jersey. But they do come with some fine print. The $500 bonus will go toward any tax obligation you have from bet winnings over the course of the year – if they surpass the reporting threshold required by the IRS – and it’s worth reiterating that you’ll have to wager the winning amount within one week of it being credited to you account. We have put together a Masters Betting Guide, which includes current odds, favorites and more. We also have a Tiger Woods Masters Betting Guide in case you want to use your 100-1 odds bet on him. He is receiving the most action at all NJ sportsbooks, partly because he’s popular, partly because he’s playing the best golf of this stage of his career. A tradition unlike any other! I’m talking about FanDuel running another 100-1 odds promo for a major sporting event. This time, FanDuel Sportsbook is offering 100 to 1 odds on any golfer to win The Masters. This is not the first time New Jersey sportsbooks have offered aggressive odds boosts for big events. For the Super Bowl, FanDuel ran a similar 100-1 offer, and DraftKings did the same for The Oscars. New users can get any golfer at 100-1 odds to win The Masters at FanDuel Sportsbook by registering here. The offer is available until the start of the tournament– but it’s worth acting quickly on, as this is an aggressive offer and FanDuel has the right to withdraw it if they are seeing too much action in one direction. The maximum bet is $5, meaning you can get a $500 payout for correctly selecting the winner of The Masters. FanDuel will pay winners within 72 hours with a promo code worth $500. While a promo code is a new way to issue a payout, this is essentially the standard way these sort of signup offers are paid out. They are called bet-through requirements and you’ll have to wager your winnings again before it is eligible to be withdrawn. For The Masters, this will replace FanDuel’s regular $500 risk-free bet offer. These sort of odds boosts are ways for NJ sports betting sites to grab new customers prior to big events. The Masters is effectively the first golf major since the start of legal sports betting in New Jersey. This represents a whole new fan base and opportunity for FanDuel to gain new customers. And unlike the Super Bowl, where they essentially booked a loss before the game by offering such long odds on the winner, golf offers an entire field to select from and, thus, less risk for FanDuel. Keep in mind, 100-1 odds effectively means +10000, so all of the favorites listed here are huge values with FanDuel. Keep it locked here for Masters betting coverage all week long.